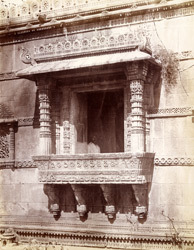 Photograph of a balcony window on the south façade of Muhafiz Khan's Mosque at Ahmadabad in Gujarat, taken by Henry Cousens in the 1880s, from the Archaeological Survey of India. This small mosque was built in 1465 by Jamail-ud-Din Muhafiz Khan, who was a nobleman at the court of Sultan Mahmud Begarha (r.1458-1511) and appointed chief magistrate of Ahmadabad in 1471. The facade has three arched entrances and carved minarets at either end. The arrangement of the minarets at the extreme ends of the building, similar to the Isanpur mosque, was a new architectural style in Ahmadabad in the 15th century. This view shows one of the balcony windows with a sill supported by brackets and a projecting roof held up by two pillars. The whole window is covered in rich carving.